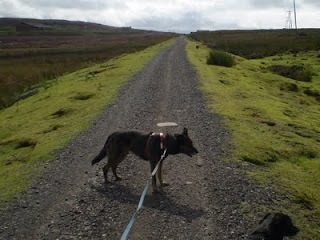 Really attentive readers may recall that last May and last October, I did my bit for the footpaths and bridleways of the very very North of Durham – so far North, in fact, that the walk started in Blanchland, which is, of course, in Northumberland. I’m a Voluntary Countryside Ranger for Durham County Council, y’see. I work alone. I’m the lone ranger. Today, to indicate my authority I wore a badge in my hat. It says Burnley FC and has a claret and blue shield. 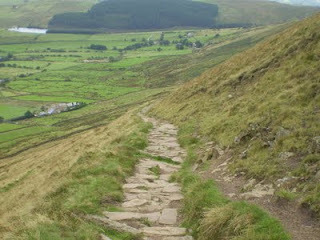 The Edmundbyers paths are much longer than the Hunstanworth ones , of course. And I found that on FP24 there are absolutely loads of blackberries and the locaal farmer has lost two rolls of hay over the wall, which he has partially demolished. Nowt to do with me. On FP1, the path is collapsing a bit more than it was last May and I realosed that at the road start, you can’t tell which gate the path goes through, unless you know already. 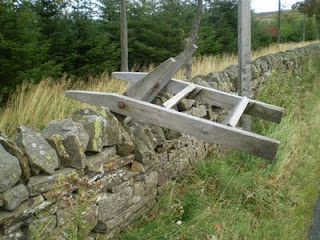 On FP29, the stile takes you by surprise when one side shoots up in the air and this dumps you in the woodland on the other side. BW32 doesn’t go anywhere that horses and bikes can go and the cows on PF8 have been replaced by little black ones that aren’t very aggressive. The gorse at the Edmundbyers end of FP8 will close the path soon (maybe next summer) unless it gets trimmed a bit. 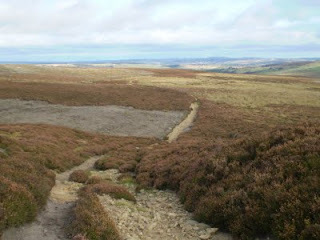 And that BW5 aka the Lead Mine trail is a fab high-speed thrash of easy walking over purple moors. Cyclists seem to like it a lot. And that was that. Autumn is upon us, the leaves are turning there was some odd bright skies and drizzle at the same time and an edge to the wind. I’ll be putting in reports about the things that need reporting. 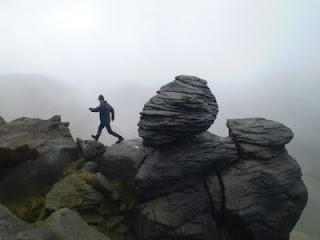 14 miles done in two circular walks – and nobody met. And I can do this walk without a map now…. Tony Bennet (Pennineranger blogger – not the singer…) came up with the idea for this. 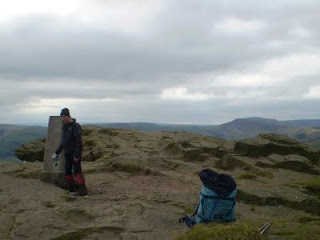 The plan was simply to walk along the Lose Hill – Mam Tor Ridge, then on up to Kinder Downfall, camp for the night and then return along the Southern Kinder edge and finish off with Win Hill. I travelled down to Derbyshire by train and camped at Laneside Caravan park and was joined in the pub by Tony at some point in the evening. Fortified by a Hope café breakfast, we left Hope (..er.. left All Hope….) on a beautiful summer’s morning and quickly bagged Lose Hill. 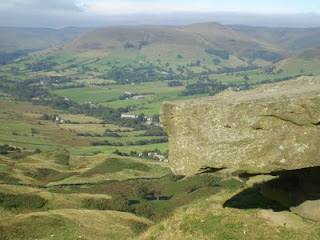 The walk along to Mam Tor was, as usual, a joy. Its justifiably popular, to such an extent that you’d be hard put to have a quiet wee. Anyway, the walk went straightforwardly enough and after passing over Rushup Edge we turned North over Brown Knoll on to Kinder. And so, to the sound of the Manchester Airport aircraft stack, we settled in for the night. 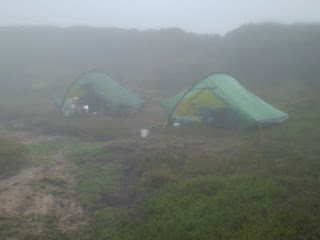 The morning dawned grey and misty with some gently drifting hill fog and soggy tents. We followed the river and hags up on to the peaty top and, on a rough bearing over the watershed to meet the edge which we then followed Eastwards. Eventually, and rather suddenly, the hillfog lifted and we got a grand view of yesterday’s walk along the Mam Tor ridge. 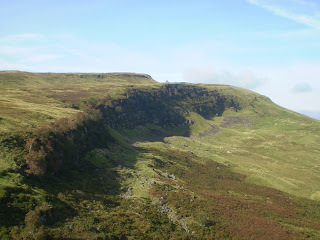 One chap along the way had no idea where he was and asked for the names of locaal features and for directions and a group of senior walkers discovered after a brief chat thet they were heading in exactly the opposite direction to where they were supposed to be going. 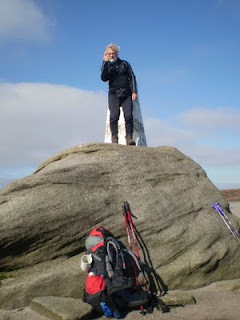 By dint of much plodding in the right direction, however, we soon arrived at the summit of Win Hill, which was about to be occupied by a large number of what appeared to be a DofE expedition, intent on camping, in a tilted and breezy kind of way on the summit. And that was pretty much it. This is a cracking route. Don’t do it, though, if you are a grumpy old rambler who objects to other people being on the same hill – because there’s lots and lots of people everywhere on these hills. Its absolutely heaving with walkers and their dogs and mountain bikers without bells. And there’s a healthy level of air traffic above too – and, even in the middle of the black bog, the sound of motorbikes on far distant roads can be clearly heard. This is no place for quiet meditation. I don’t mind the people and dogs, really. I find these busy places in the hills quite interesting. But if you want quiet – go somewhere else. I just bought a pair of "Hiking Sticks" (we usually call them walking poles, I think) at Millets in Bishop Auckland for a ha'penny under £3.75 EACH. which is what I want, really.. The old ones, bought in 2007 at Dornie for £10 each after my even older, veteran ones of just about 10 years of clitter-clatter have been failing to stay up for a while now, despite the attentions of a spanner and a big rock. They're "Yellowstone" hiking sticks. Thats "Yellowstone" for all of your hiking stick needs. I'll be trying out the "yellowstone" hiking sticks on the peaty black bits of Kinder along with PennineRanger Tony Bennett (that is, I'll be trying out the sticks, not Tony Bennett... dhuhhh....) this very weekend. Incidentally, the shaft (ahem) of the poles have various slogans on them - one of which is, and quote: "Reduces strain on the wrists!" This is exactly what I want. The plan for today was to go and bag Lendrick Hill, followed by lunch, then followed by the bagging of Innerdouny Hill, and, if there was energy and motivation, Steele’s Knowe as a sweet course. Didn’t quite work out like that, in fact , I’m a bit ashamed that I bailed out of this expedition a bit early. 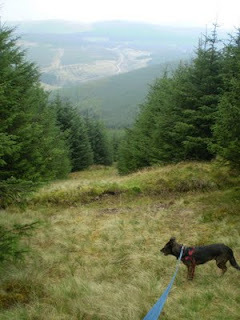 We trotted off up a forest track and soon came to a part where the forest and the unforest were only a few yards apart. As I had no idea if there was a big fence at the top of the forest rides – of the twelve-foot deer excluding type so difficult to get a struggling dog over, for instance, and encouraged by a “walkers welcome” marker on a post , I left the track and entered a damp tilted jungle of enormous grasses and deep bracken and steep tussocks. 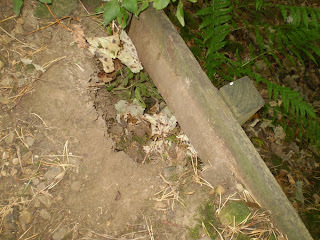 More posts with welcome signs on them encouraged more upward progress, and so we heaved and stumbled upwards, thrashing and falling, tripping and tangling. A flock of sheep on the other side of the fence sniggered. After an age, during which both me and superdawg grew beards, we emerged on the hilltop and, leaping the small barbed wire fence, we homed in on the summit furniture – in this case, an old cairn on a lump (maybe a tumulus?) and a trig. A good, clear path lead us easily down a forest ride on to the track we’d daftly abandoned earlier. Then it started raining. The nearby bigger lumps of Ochils disappeared under cloud and mist. We began to get wet. I drove then to the car park at the foot of Innerdouny. This one has forest almost all the way to the top. The drizzle drizzled ever more drizzly. I just couldn’t be arsed. I repaired to the tent, calling at the store in Thornhill for more celebratory stuff. My daughter and her boyfriend arrived and pitched their tent. We ate chillie and spuds and the sun came out. 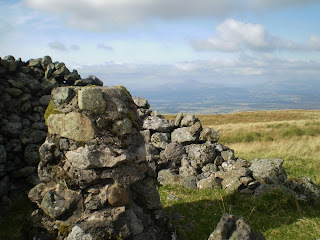 The main Ochils group are much better than this – but I’ve been all over those hills and I was supposed to be doing something new. On the middle day of my three day sojourn, I decided to have an easy bag and go and get Meikle Bin. This is a tad higher than yesterday’s Fells, but seemed to have a reasonably easy approach through forestry from the Carron Valley Reservoir. Unfortunately, I left my camera in the tent (dhuhh), so there are no pictures. And, to make this post, and, lets be honest, me, appear more interesting, I am going to resort to the use of random inverted commas around various words during this posting. This will make it appear that some of the things I am saying have other, more subtle meanings and make it seem that I am a lot brainier than, in fact, I really am. Take no notice. It “just” an affectation. So, we (that is, me) parked up next to a bored –looking coach driver counting the little holes in the leatherette cover of his steering wheel yet again, and marched off up various forest tracks which ultimately lead to a muddy path brushing through a narrow bit of tree cover to assault the michty slopes of Meikle Bin.This is The Big Bin. I could hear various raucous noises “coming” from the hill and a couple of “teachers” descended towards me, japing that I “wiz cheeten haevin ae dug tae pill yea up they hill”. 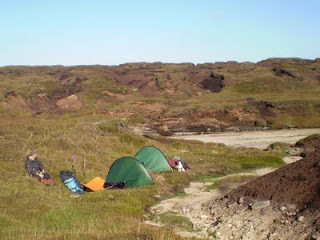 These were shortly followed by a slipping, sliding crocodile of “children” dressed in various items of camouflage, pink wellies with little red lips on them, very short skirts, various other unorthodox hillwalking “gear” and ipods, mobile phones and other bits of technology not “yet” invented. They were all friendly and, much to Bruno’s delight, incontinent of biscuits and the contents of the butties their mums had put up this morning. 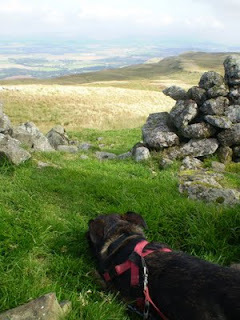 Bruno tidied up around the summit trig point. 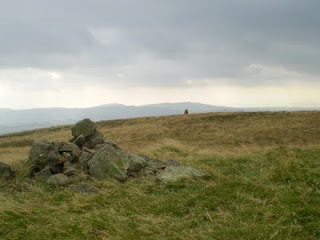 Soon, “they” were gone and all was quiet and I was left to shiver and eat a banana by the trig point. A cold and miserable day, it was, so I didn’t hang around. I left early and went back to the shop at Kippen for more celebratory stuff. Late info: Apparently, the aircraft wreckage near the summit is that of a Fairey Firefly number PP556 which was reported missing on 8 January 1950 and was later found crashed on Meikle Bin. The crew, Lt J Arthur Robertson and Naval Airman J Smith had both perished in the accident. From my forward operating base (ahem) at Mains farm campsite at Thornhill, I drove the few miles to the foot of the Campsies, at a place near Keir Knowe, an unusual motte-like earthwork, I parked the knipemobile on the verge, saddled up the dog and inserted myself up the track to Spout of Ballochleam, avoiding some suckler cows by the deft use of a deep dell or gill, or whatever they’re called up here – anyway, the cows couldn’t see me or the dog. 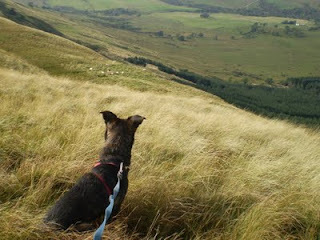 The local buzzards probably could see us, though and were wheeling and mewing over the top of us in a vulture-like way. 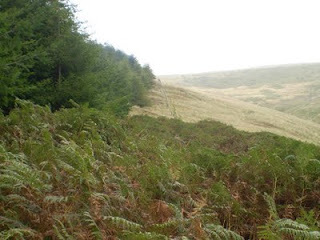 And I just followed the track which climbs over a heathery ridge past a little bothy with a keeper working in it, and almost to the summit of Carleatheran – a very easy way up. 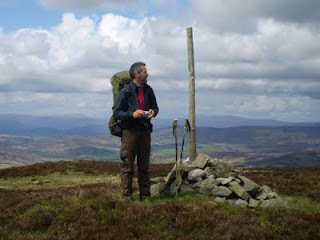 Carleatheran appears to have an almost-Welsh name, a very large ancient cairn and a trig/shelter on the top and, from the top of the scarp a few hundred metres North, a stupendous view of the middle bit of Scotland. The scarp is a remarkable feature and runs for several miles, more or less East-West with few chinks in its armour (for the finding of a comfy way up or down). It would be worthwhile following the scarp all the way from one end to the other…..
After a lazy lunch in the sun in the summit shelter, I followed the edge of the scarp back down to the Spout of Ballochleam. Things then got a bit tough for a while. I handrailed the Boquhan Burn uphill for a mile or so of tough heather, bog and tussocks. It got easier with a bit more altitude, though and a vague ridge took me to the summit of Stronend with another trig in a shelter. The scarp slope took us back to the neb overlooking Keir Knowe, which I’d noticed earlier has a crag-free descent back to the car. 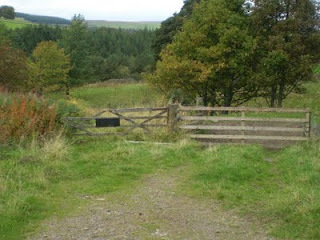 This is fab walking country and, apart from the keeper and a distant view of a shepherd on an ATV, I saw nobody else. Maybe it was Thursday. Maybe its just very quiet anyway. I did about 13 miles and 2200 feet of up. The shop at Kippen provided a cheap bottle of vino collapso for post-walk and post-birth celebrations. Bruno wasnlt allowed any as he’s not old enough. Just before I launch into an exposition of whatever it was that happened on my recent visit to fatdogland, I'd just like to say that in the wee small hours of 18 September, another wee Knipe was added to the inventory of wee Knipes. Thomas emerged in Nottingham at 2:30 am and probably weighed something - look, I have no idea how much he weighed or any of the other details, apart from the fact that he's called "Thomas". This will be interesting when they visit Chez Crook Knipes since next door's cat is also called Thomas and superdawg goes mental at the window whenever the name is mentioned, whether or not there's a cat there. 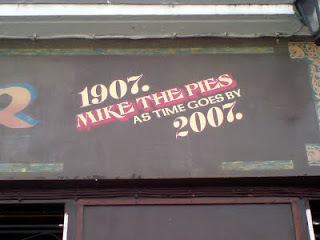 As I don't have any baby pics, I thought I'd ceklebrate by publishing this Irish pie shop sign that Charlie sent me a while back. Anyway, its another Grandson. That makes three. After several days up a ladder with a paint brush, I now have sufficient Good Boy Points for a few days off in the middle bit of Scotland for the bagging of a few of the smaller but nevertheless interesting hills in the Campsies, Trossachs and Ochils - and , possibly other places nearby. Anyway, there will now be a short pause whilst Superdawg Goes Camping. and the Craigs of Monvreckie calls for a thing beginning with "C"
Utterly irrelevant picture of the Moffat Hills is published, other than to encourage people who've never been to the Moffat Hills to go and have a look, cos they is fab, like. Today’s job was to help out, as a Countryside ranger-type volunteer at an opening event of the new parkland and facilities at Hardwick Hall just beside Sedgefield. 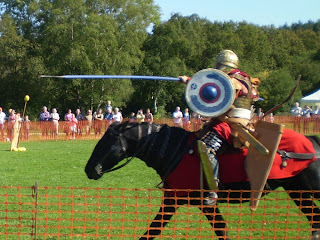 The day was called “The Romans at Hardwick” and had all kinds of jollities such as dressing a load of children up as Roman soldiers and drilling them till they got even scarier than they were before they got..er.. drilled. There was also a roman potter making roman pots, a roman weaver and a roman herbalist. 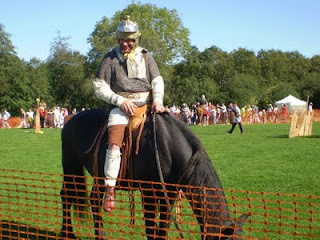 And a hog roast, a tea van, some Romans camped in ultra-light tarp-type fashion (see, its not that new!) 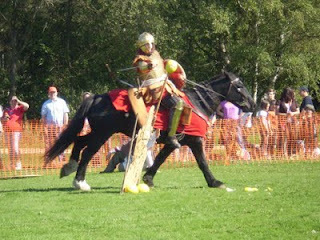 – and, best of all, a display by some Roman cavalry who did some archery, chucking sharp things at other things, attacking some infantry with blunt lances and javelins and big darts – and doing stuff that police horses do. My job for most of the day was to avoid al of this and wear a high-vis jacket whilst explaining to drivers why they couldn’t get through a certain gate (it was locked) – and giving them directions. Only one was a bit miffed. Another complained that he couldn’t get into the hotel because all the wedding guests had blocked the way..? eh, wha? 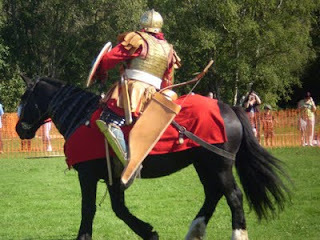 I did manage to watch a cavalry demo, though, and have a little walk around the park grounds, which, I must say, are rather fine. 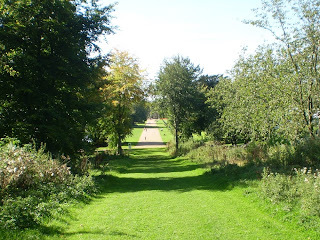 The park belongs to Durham County Council (this is where some of your rates go girls and bots) and its very popular with the locals, but not very well known outside the area. Which is a pity, cos it’s grand. The next event there which I’m due to help at is on Halloween. Should be a laugh. And now for something completely different…. A man with a doorbell up his nose. Actually, nothing to do with nasal doorbells – as winter draws on and the nights are getting longer, there comes a time when all good walks either start or end in the dark. Theres also always the possibility that due to some misfortune, it will go dark in the middle of a walk. So, I decided to have a walk in the dark – to sort of, get accustomed to the idea and, frankly, to do something different. I parked up at Cowshill in Upper Weardale at 9:00 pm and crept passed one or two farms and a keeper’s house quietly so as not to disturb any dogs (unsuccessful) and arouse any suspicions as to where I might be going dressed like a hillwalker at that time of night. Navigation along this ridge is specially easy because there’s a fence to follow, which goes all the way to Killhope Cross. Parts of the fence are new, though, and don’t appear on my map, so it’s a bit of a leap of faith to follow the thing at first. I soon hit some very deep and squelchy bogs and, after the first dunking, I decided to try my bootless walking theory and removed my boots and socks. This was a cold shock at first, buit once you stop worrying about wet socks (no socks), the peaty bogs are actually quite pleasant and even knee-deep sucking slutch was no hindrance – I just battered on through. 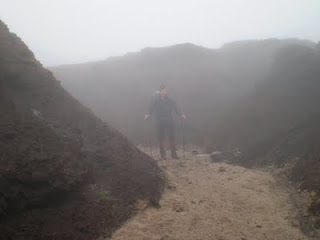 Soft peat, hard peat, sand and stones, grass and heather.... but nothing painful! A yellow half-moon appeared just after High Field and when it broke through a cloud, I could turn off my light and walk by moonlight. The thing I noticed the most was the absolute and total silence. 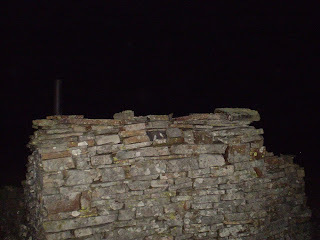 It was a windless night and would have been frosty if it happened in just a few more weeks time. A really cold, frosty, moonlit night up here would be absolute magic. I could see the orange glow from Durham/Tyneside, and the occasional light in the sky, but apart from that, it was just me and the stars and the moonshadow. 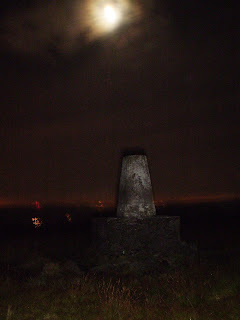 I pressed on to Burnhope Seat , at 746 metres, tonight's high point, and, further to Dead Stones 710 metres, where I spent an hour or so hunkered down inside the howf. Rebooted, the next part, over Lambs Head was tough. Here, I met a maze of bogs and hags and at one point I seemed to have lost the ability to balance. I teetered from tussock to bog hole. 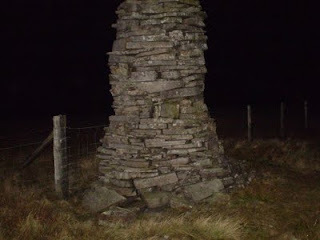 It took an age to get to the trig point on Highwatch Currick. I began to be very late and I couldn’t get a mobile signal to send a message home that I would be late. 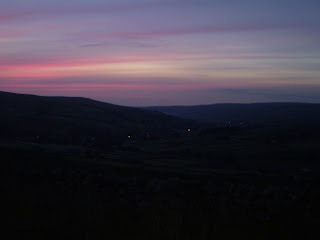 Dawn dawned as I reached Cowshill and, after driving a little way down Weardale, my text message was sent. I got three in return – a missed call from home, a “if you don’t reply to this, I’ll come and get you” message and an acknowledgement of my text. Next time, I should give these things more time. It’s a lot slower in the dark. This walk would be absolutely cracking on a fine, clear, cold and frosty January night with a big moon. But not an experience to have with the chatter of companions. 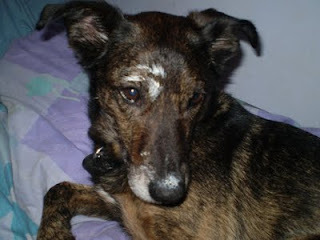 Many years ago I had a dog who only leant on walls immediately after they'd been painted. I've just spent two days painting ceilings, skirting boards, shelves and door frames in the dining room at Pie Towers. And I noticed this. Superdawg's eyebrows, nose-end and tail are now white. Somewhere, there's a patch of paint with dog hairs stuck in it. After earning some good boy points by painting things, Maggie suggested that she’d like to visit her pal in Carlisle and then go shopping and if I wanted, she’d drop me off in Carlisle and pick me up again at the end. 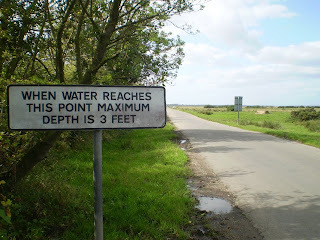 There’s a riverside path, then some cow fields with cows, a long, straight road with signposts whoch tell you how deep the water is when the tide comes in (3 feet at the most – so you shouldn’t drown) – and then, that’s basically it. You’re at the end with a pint of mild in your hand. The locals are remarkably friendly, and quite a few had a nice greeting or a joke about the summer (it finally arrived at about 1:00 pm today). This must be a happy locality. The Solway coast is certainly a bit stark and beautiful. But there’s a certain relaxed sort atmosphere about the villages. You won’t get mugged here. And the hedgerows are now absolutely heaving with berries and fruit of all kinds. So I had a healthy, grazing sort of walk till I got to the Greyhound at Burgh by Sands where I spoiled it all by drinking several foaming pints of Black Sheep. 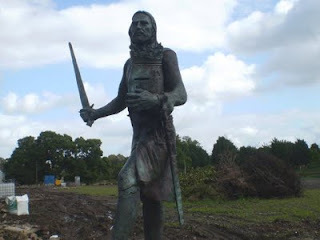 Outside the boozah, there were five men from Kent and a statue of Edward I with a sword. He died near here, apparently, just on his way to hammer the Scots once again, but leaving the job to his foppish son Edward II who buggerred it all up at Bannockburn and then, due to some other buggerry, was murdered with a red hot poker in exactly the place you don’t want a red hot poker. None of this is at all relevant to this walk. Maggie appeared just before Bowness on Solway and we went off to caldbeck for a nice dinner at the pub there. 14 miles and virtually no ascent at all – it’s a bit rolling at the most and often quite, quite flat. So that’s Hadrians Wall eh? Two flat bits and a bumpy bit in the middle. It’s a good walk. Its very popular. You should enjoy it. Go do it. Buy the maps now and larn Geordie. 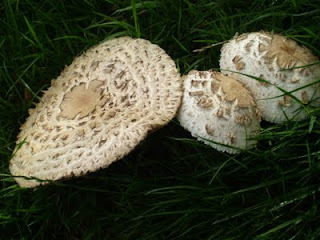 Anybody know what the mushroom is by the way? 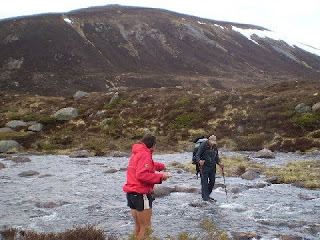 The 2009 TGO Challenge Report. Phil (Lord Elpus) Lambert at Whiplash Hall has triumphed once again and turned a set of competely inane ramblings into a neat and tidy set of completely inane ramblings. 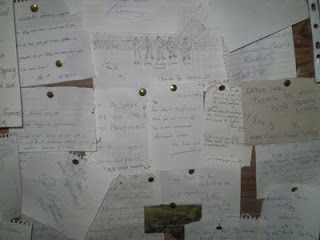 Just about to post off my application for the 2010 TGO Chally - the envelope has had it's stamp on and been sitting on the mantelpiece for several days now. But what route shall I attempt? Shall I turn on my GPS this year? And will I ever learn to pack the inner of the akto seperate from the outer when the outer is wet through and the inner isn't. I used to live within sight of Pendle Hill, and, one or two of my immediate female relatives had some rather unusual religious habits, and, some might say, powers...(oooer) - so, after several failed attempts at arranging a meeting due, I finally met up with a Manchester van driver called John in the car park in Barley, at the very foot of Pendle Hill. John goes by the "user-name" of "Yomper" on http://www.walkingforum.co.uk/ and , following my recent policy of enjoying walks with as many different people as possible, it was through this forum that we managed to arrange this little trundle. And worra pleasant little walk it was. 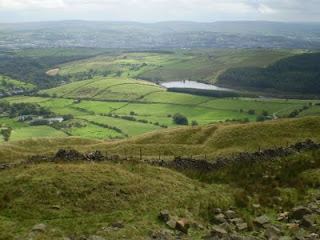 I had last climbed Pendle on halloween 1975, at midnight. This seemed like a good idea at the time, but turned out to be a really bad idea as it happened. The place was a madhouse of Burnley vs Man Utd fans beating crap out of each other, druggies and drunks laying around the summit and fireworks going off in any direction other than upwards. 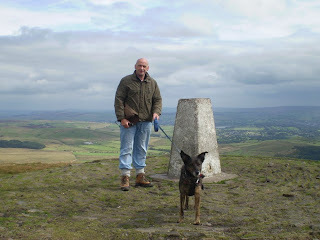 Anyway - me and John and superdawg climbed up the slanted path that goes up to the top of Pendle, had a little brew near the top, and came down a slanted stepped path back to the foot. The views from the top are remarkable. Afterwards, we repaired top the Pendle Inn for a Pendle Bitter and then I Pendled off to Bleara moor for a bit of a poke around old haunts. It was a bit drizzly by then, so I didn't explore too far - I'll be back here with my brother in a while anyway. 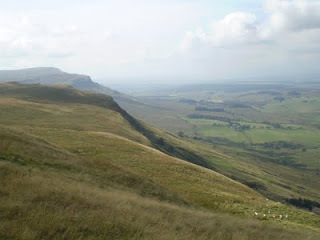 A good day, though - I think we probably walked around 4 miles and climbed about 1100 feet altogether. One last thing - when I was about nine years old, my uncle from California visited us in Earby, and brought with him, by ship to Liverpool, an enormous American car. This proved to be disastrous because, one day he took his brothers and sisters (my aunts and uncles) and a partner or two on a drinking day in Skipton, and on the way back he crashed the car into a tree and an "uncle" was killed. Shortly afterwards, the bend where they'd come adrift was straightened out, but, having seen the wreck of the car in the local garage, complete with family blood and hair, the bend where the crash happened and what had happened to the aunties had haunted me for a long time, possibly years. 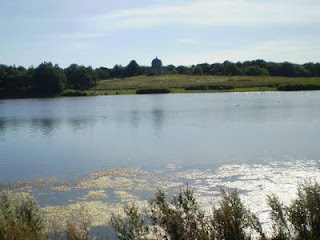 And today, I visited the place by taking the old A56. And the tree is still damaged. Remarkable. Thats more than fifty years. Thats a ghost laid to rest, finally. 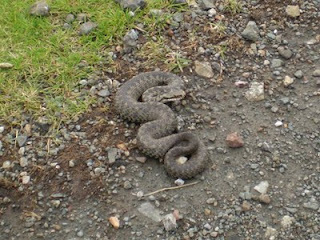 In the occasion of Wolsingham show, daughter Becky had a visit this weekend and we had a little walk with the dogs along a breezy and cool Waskerley Way, just above Stanhope - and we met with this little adder. The snake was very dozy due to the cool weather, but we kept the dogs out of the way just in case. It had gone by the time we returned a while later. 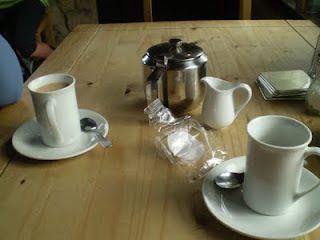 Later, we repaired to the Park Head tea room, beloved by many a CtoC cyclist, and by me, as it happens. 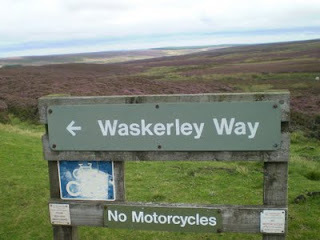 The Waskerley Way is mainly used by cyclists, some who are "doing" the cycling Coast to Coast route. 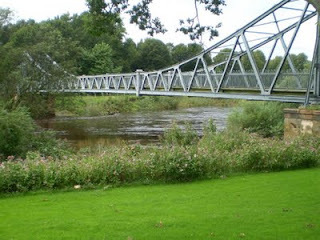 Its part of, and links im with many miles of ex-railway line paths across Co Durham. There's miles and miles and miles of these. They're great for a good old blast at speed, but they can get just a bit dull after a few hours of left/right/left/right. Its all down hill to Sunderland from here. though, if you're on a bike. I think that Cumbria is in the North-West of England. Carlisle is, surely, a North-Western city. So, when the weatherman said it will be wet in North-east England, it could be argued that in Cumbria, there wouldn’t be so much rain. Apparently not. I set off from Birdoswald at 9:00 am in chucking rain and walked for the next five and a half hours in chucking rain, and a further hour in drizzle. A Kiwi in an unusual jacket and hat I met along the way suggested that England wouldn’t be so nice and green but for the rain. And, as for the mud? Mud? You’ve seen nothing like the mud we’ve got 176 degrees South of here, mate..
As the day continued, the mud got muddier and the fields got more flooded. In parts they were quite shallow – only a few inches. In others, things were getting serious for the worms. 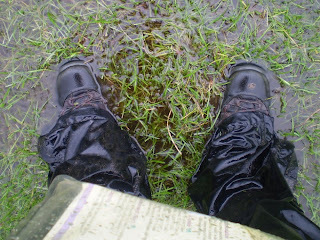 I considered taking off my boots and socks before they wetted out completely. Maybe I should have done. Bare feet could well have been just the thing. Its very soft and sloppy. I pressed ever Westwards towards the brightening sky. It was just a different colour of rain. I sheltered in a sort of garden hut in a garden at Haytongate. 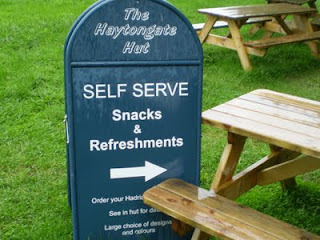 I made a cup of tea, considered the mars bars too expensive at a quid a go and put my money for the tea in the honesty box. I read the messages on the wall. The emperor Hadrian was, apparently complaining about the state we’d left his wall in, and various peope said thanks for the tea… Later, there was a wooden box in a grassy (slightly underwater) lane. Inside the box there were sweeties and crisps and a little dish to put your money in. It’s a good idea, this, provided nobody nicks anything. Was the bar at the closed pub in Walltown really an “honesty bar”. 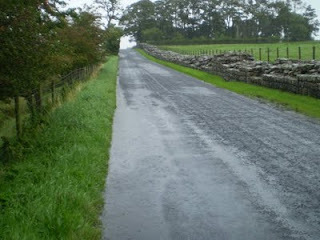 I didn’t have time to find out, I had to keep going towards Carlisle and the last bus to Birdoswald. It would be an expensive bus-miss either in terms of extra walking effort or yer actual money. 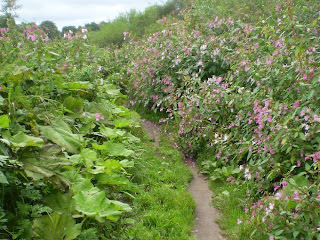 Eventually, after 18 miles of mud and rain and Himalayan balsam by the riverside – I arrived in Carlisle – and promptly got lost, passing Debenhams three times from different directions. I caught the AD122 bus back to Birdoswald, though, with 20 minutes to spare. Possibly a close run thing. Rain? Don’t talk to me about rain…. 18 and a half miles and just 700 feet of climbing. Probably a very nice walk on a sunny day in early September. The brambles are fruiting and the elderberries will be ready in a week or so – so if you want to make wine, there’s absolutely loads of ‘em. And very depressed-looking cattle and sheep. But what of the route – well, it’s easy again. Very easy walking, in fact. 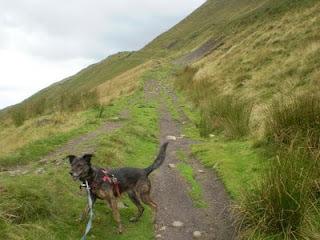 Not much uphill at all either, and its still well waymarked. 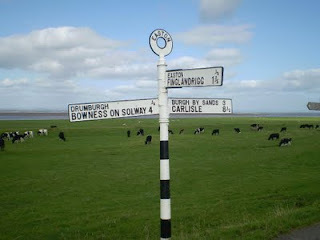 And, apart from the honesty tuck shops, there’s a few pubs/hotels and a farm near Crosby on Eden which does snacks. The archaeology gradually disappear to just a flooded ditch (maybe not always flooded!) 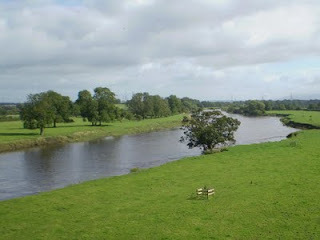 – and then there’s a bit of lane walking, then some nice riverside paths which take the walker into Carlisle without seeing much of the city. It’s a short trundle into the City Centre. Nearly finished this – just 14 miles to go. Eel Crag? You jokin' innit?